Service time and over 100 million installed bonds prove that the CADWELD Process provides the ultimate in desirable features for railroad signal bonding. ERICO provides an offering of both rail head and rail web signal bonds. 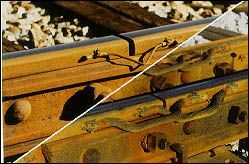 CADWELD rail signal bonds can be used on old, worn or new rails. Note: All 3/16″ Joint Head Bond Terminals are 3/4″ long; 5/16″ are 1″ long. Necessary Welding Material, a flint igniter and a pair of replacement molds are packaged with each 100 bonds. Two complete mold cleaners are supplied with each 500 bonds. 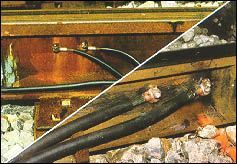 All electrical connections to rail should be welded with the CADWELD copper-based exothermic welding process as manufactured by ERICO. All connections within the splice bars should be to the “field” side of the railhead. All other connections should be made on the rail web at the neutral axis.